At Plum Organics, we believe that all children deserve access to healthy, wholesome foods. We want kids to grow, learn, and play... and one day change the world. Plum kids know that what’s good for you should taste good too. Our organic packable snacks make it easy to nourish your kids with yummy, balanced nutrition. From lunchtime to on-the-go kids never stop, and neither does Plum. So grab a snack from our whole line of fruits, grains, yogurts, and yes even veggies! We’ll be there anytime with real organic foods to inspire a joy of eating and energy for exploration. A Mashup of pure, organic fruit and veggie fun! We’ve taken real organic fruits and veggies and mashed them into purees you can squeeze and eat! Plum Kids Fruit & Veggie Mashups have all the natural sweet of your favorite fruits and some extra pow from colorful veggies. They’re great for tossing in the lunchbox for school lunch or eating on the go. We like to think of them as an easy squeezy way to snack! Our innovative shelf stable pouch retains freshness, flavor and nutrients of purees and offers easy feeding with a convenient, portable and resealable no mess solution for kids. Our products are certified organic, nutrient rich, free of high fructose corn syrup, trans fats, and artificial ingredients. 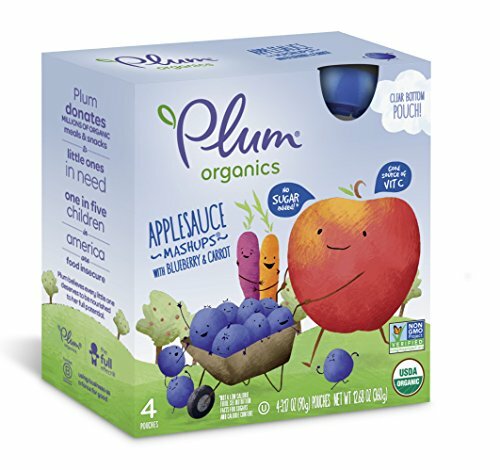 Organic Fruit and Veggie Mashups from Plum Organics a fun, healthy snack for kids on the go!